Quoting for a job can be quite a tricky business and it’s all too easy to under or over estimate the true cost. Under-estimate and you’ll be out of pocket, over-estimate and you’ll be out of a job! So, how do we go about creating a reasonable quote that doesn’t break the client’s bank or yours? 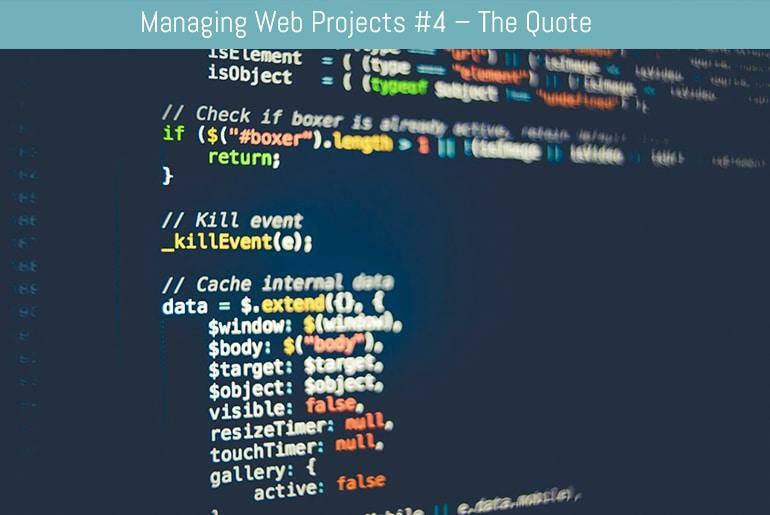 One of the things you can do is keep a log of all the time you spend on projects, include everything from the requirements capture, design, build – even how long it takes you to write an email or take a phone call from the client. After a while you can use this to build up an pretty accurate picture of how long a project will take. But of course you’re doing this already for invoicing purposes, right?! What’s the client like? Are they happy to let you toddle off and get on with it or will they be ‘phoning you up every five minutes asking for silly minor changes? If it’s the latter then you need to either charge by the hour or anticipate this and build it into your quote. Will they deliver content on time? If you’re going to be sitting around twiddling your thumbs then get at least 25% of the cost upfront, that way at least you have some money in your pocket whilst the client is faffing around. There isn’t much point charging £100 an hour when Joe Bloggs down the road is charging £50, you don’t want to price yourself out of the market completely. Don’t forget that most businesses get three quotes and they usually go with the lowest – hence the reason why a lot of companies end up with a website that looks like it’s been designed in someone’s bedroom – because it has (not that there’s anything wrong with that, I used to do it! But I’m sure you know what I mean). This is really a personal preference, and both require you to work out how long a project is going to take. Hourly rates are easier to negotiate if the project starts to run over, but you may be able to get away with charging a bit more money for less work on a fixed rate quote. Personally I always go for a fixed rate, that way the client knows exactly how much they’re going to have to pay and what work they’re going to get for that money. Also, I think a lot of businesses tend to be a bit wary of hourly rates as they can soon spiral out of control and they can end up paying a tonne of money they didn’t want (or necessarily need) to spend. Of course, this is good for the developer but unfair to the client. And in a world where word-of-mouth is king you can’t be seen to be unfair! Whether you’re going to charge £10 an our or £5000 for the whole project, you still need to know how long the project will take and what your rate is. How many hours are you going to work a day? I know the answer will be “As little as possible” but I’ll plump for 7 as you’re not a part-timer! To earn £25,000 take home we’ll actually have to earn £35,000 – frightening eh?! Tax/National Insurance is a whopping £9500! Not too confusing I hope! And quite a resonable sum really. That all depends on the site, the design and how fast you work! Generally, for complexish designs I allows 4 hours. This is the homepage and an internal page (obviously if they’re the same template you only need to do one), however for a site I’m doing at the moment I’ve already got the design in mind so the graphical elements will only take 20 minutes to knock up. This of course is personal and dependant on how familiar you are with the software package you’re using, whether the client has provided a logo or you need to come up with the corporate branding. In regards to the html “templates” again that’s all dependant on how you’re going to put it together. You can create the website straight away by slicing it up in something like ImageReady (if you like weirdly named images and not being about to work your way through the source code), you can you tables or CSS. Personally I tend to go for the latter as it’s quick to implement (I have a standard set of CSS files I use and can just “plug and play”) Also, are all the pages/sections the same? If so creating a master template will be simple but if you have to mess around with different page styles it’ll take a lot longer. Site type: Database driven visit schedule, mutliple user logins/access levels, multiple clients, contacts, messaging system. Wow… expensive eh?! Of course that’s for a super-dooper big client and it depends on what the client’s willing/able to pay (and whether you drop the quote as it’s new business and charge them full whack on the next job in order to keep them). Site Type: Content management system to drive site but allowing for additional uploads. File upload required, WYSIWYG editor, dynamic CSS menus, site map and site search. These are just rough examples, and not necessarily what I’d charge – for example the static site is priced differently to the cost above as it’s a friend of a friend who’s having it done (plus I may get referral work from him) so you have to be flexible. When you’re estimating the time it’s going to take to build the site always add on extra. Someone I know adds a further 50% (a bit extreme I think), some pick a random number, some use Pi. I go for x2.5. This allows for the client being lame, unforseen errors, testing problems, database issues, fiddling with server etc. I send mine out as a PDF attachment, with a copy in the post. This has my logo on it, address, contact details and a break-down of the stages of the project and associated costs. Most clients won’t accept the quote unless they know what they’re paying for. Make sure you get acceptance of the quote in writing. It’s often a good idea to get the client to fax/post a copy of the quote back with their signature and the date on it. This means that any disputes over price later can be thrown out.